This year has got off to a great start and I have already booked most dates for The Art Boat tour. 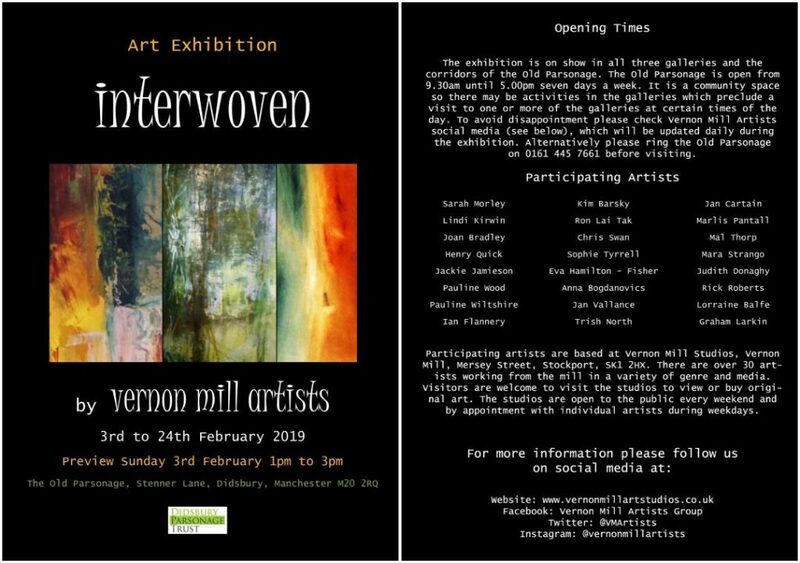 Time is flying and I can’t believe there is already less than a week left to visit The Old Parsonage in Didsbury to see the Vernon Mill Group Exhibition “Interwoven”. A wonderful exhibition in a beautiful setting, by a diverse group of talented artists. Well worth squeezing in a visit before it closes. Mum and I at The Old Parsonage Didsbury. The Art Boat Tour 2019. The winter is when I plan the rest of the year, and it’s looking good so far. These are the events that are already scheduled for TheArtBoat. A mixture of Floating Markets, Festivals and exhibitions. I will also be dipping my toe in the unfamiliar world of Art Fairs. But most exciting (for me!) is the open studio that I am planning for the three weekends before I set off on the Art Boat. 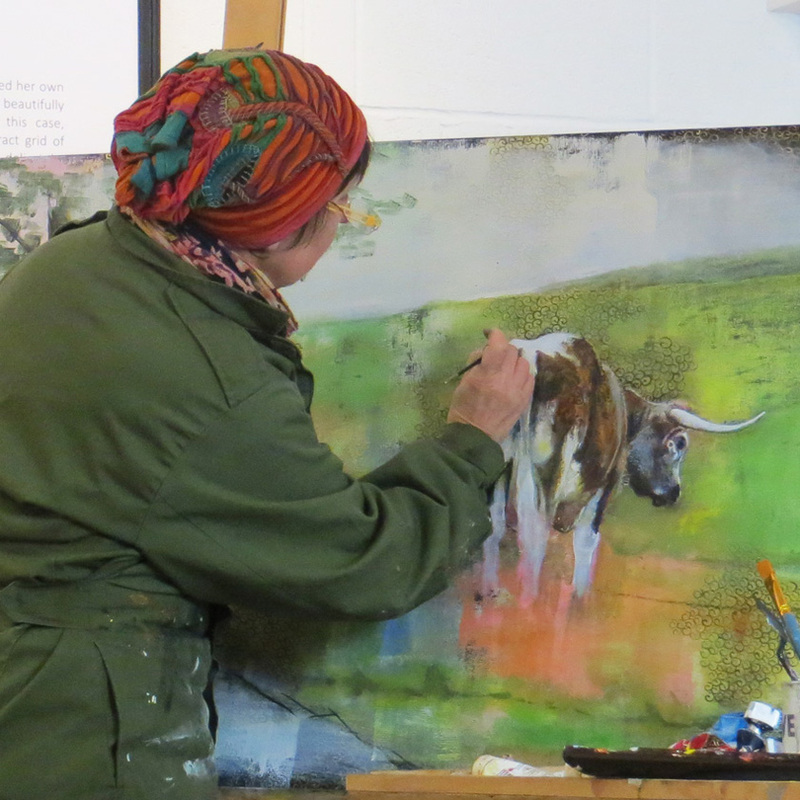 This will be the first time that I have opened my new studio to the public, and I’m quite nervous as it will be very different to my past experience, taking part in group open studios. I have added links to some of the events and will insert more as they become available. Please bookmark this post as I will come back and add events as I book them. 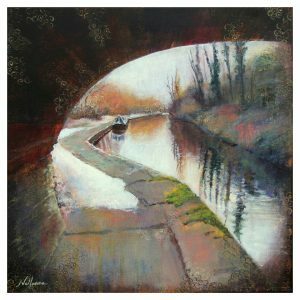 There are already a couple of Guild of Waterway Artists exhibitions in the pipeline.  Fri. 19th Apr-Mon. 22nd Apr. 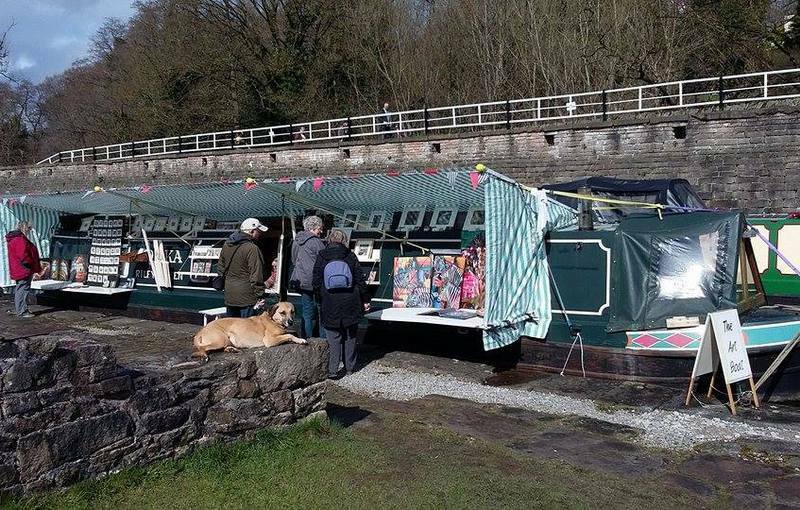 Great Haywood, RCTA Easter Floating Market.  Sat. 29th Jun-Sun. 30th Jun. Braunston Canal Festival. GoWA exhibition.  Sat. 10th Aug-Sun 11th Aug. Blisworth Canal Festival.  Sat. 24th Aug-Mon 26th Aug. Merry Hill, RCTA August BH Floating Market. 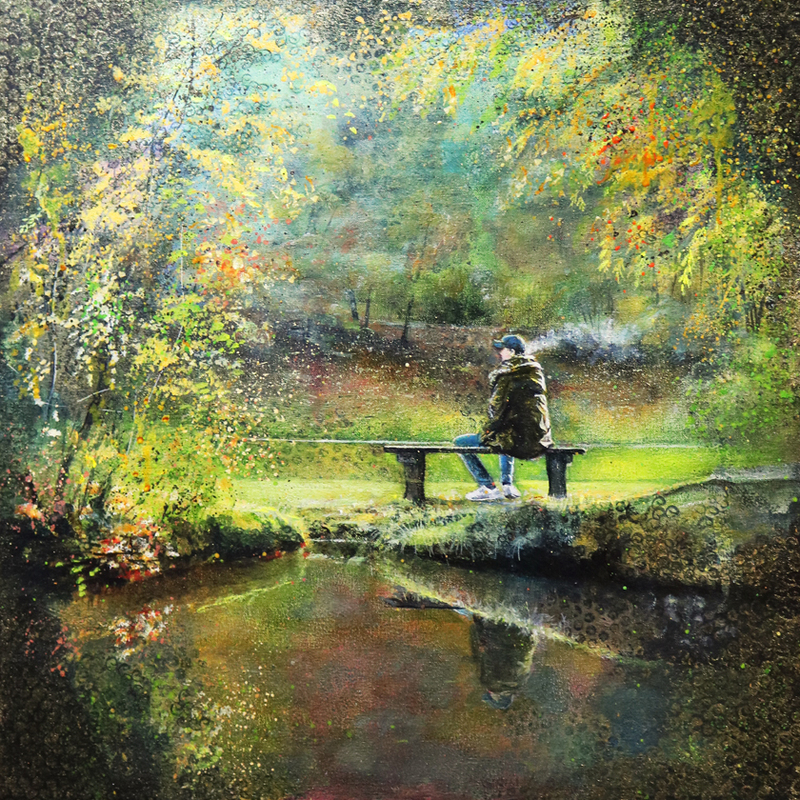  November/December Audlem Mill/Jan Vallance. GoWA exhibition (Artists changing every 1-2 months). Hope to see you at one of these events during the year…there are plenty to choose from. Don’t forget to bookmark and check back as I’ll be updating the information as I travel. Bye for now…and hope to see somewhere soon! There it is gone! 2018 raced by and we are already nearing the end of January 2019. 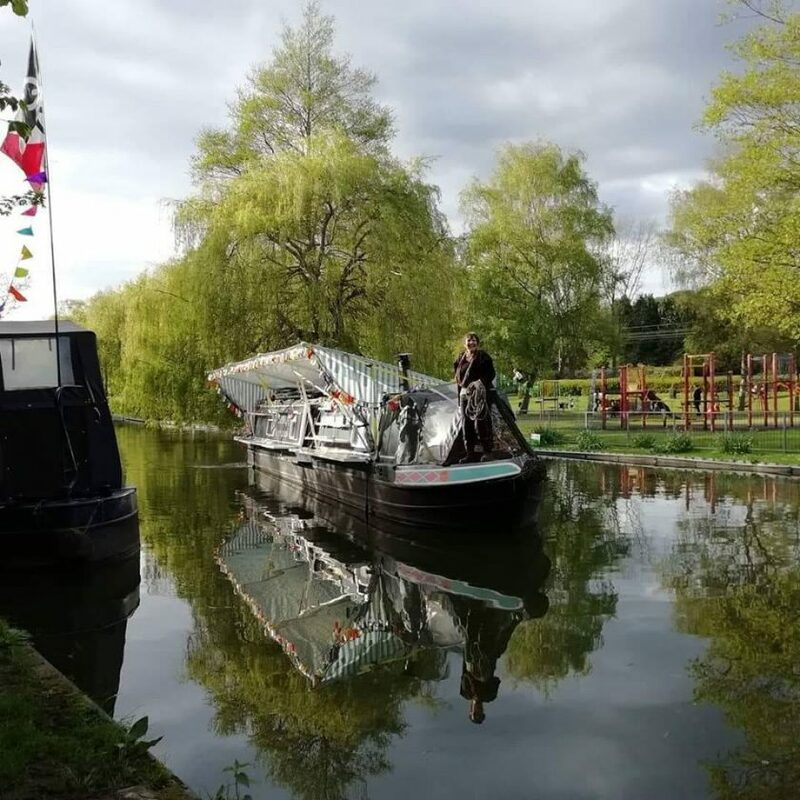 It’s a tough job to choose from the many wonderful experiences but, the highlights of last year were, taking TheArtBoat into London, two new group exhibitions with the Guild of Waterways Artists and moving to a canalside studio in Marple. Many more notable events, but those are just three of the ones that stood out for me. The variety of canalscapes in and around London were unexpected. 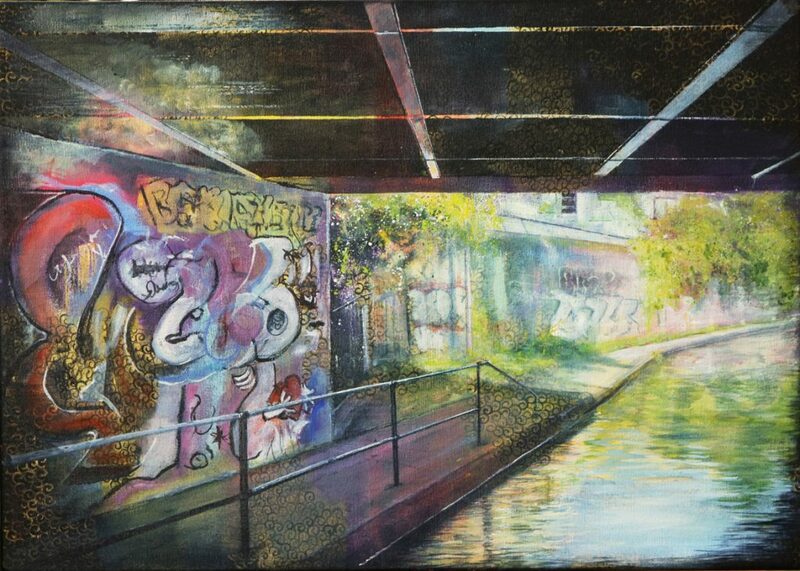 Bridges dripping in graffiti, bustling towpaths, colourful boats and the lovely calm and wide River Lea. Needless to say I was inspired to produce several paintings based on London scenes, and am putting aside some studio time soon to do more. Even the madness of searching for scarce mooring spots, and the racing cyclists, didn’t detract from the buzz of being in this linear village. My new studio is Amazing! …but you will have to wait to hear more as I have decided this exciting news deserves its own blog post! 2018 has been a hectic but successful year. I’m now painting like one possessed in order to have enough paintings to set off on my 2019 Art Boat tour in April. I’ll be putting the schedule on my blog very soon. 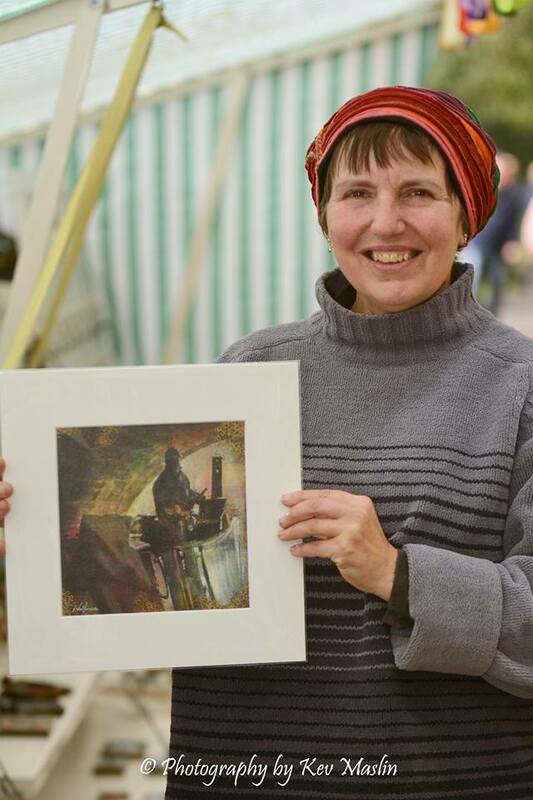 First on the agenda though is a group exhibition with the Vernon Mill Artists. Twenty plus artists will be showing work in the historic and picturesque Old Parsonage in Didsbury. Running from the 3rd to 24th February with the preview from 1pm-3pm on Sunday 3rd. I’m excited to be part of this exhibition and am hoping that those who haven’t got too far to travel will be able to visit. Both are new events for me so I am really looking forward to them. 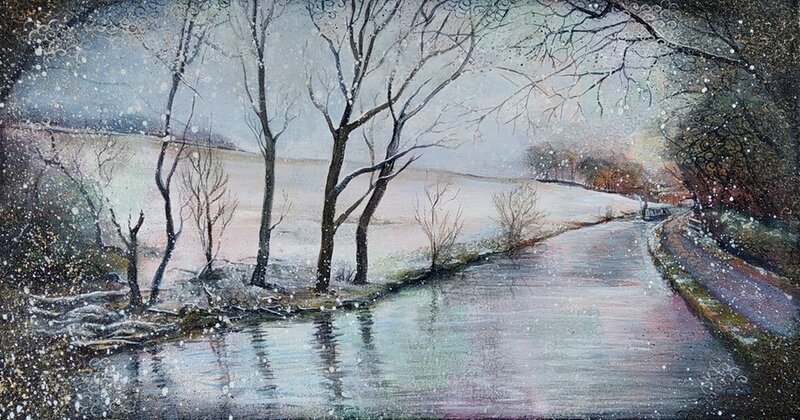 One of the paintings that has been re-homed this year. “Tranquil” a portrait of one of the distinctive locks on the Grand Union Canal near Watford. What I have been up to so far this summer. 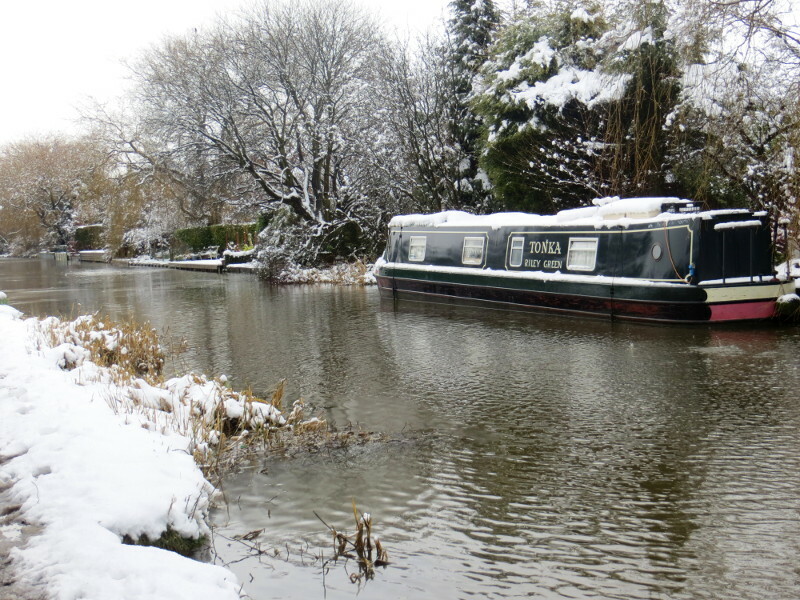 I loved being down on the Grand Union. 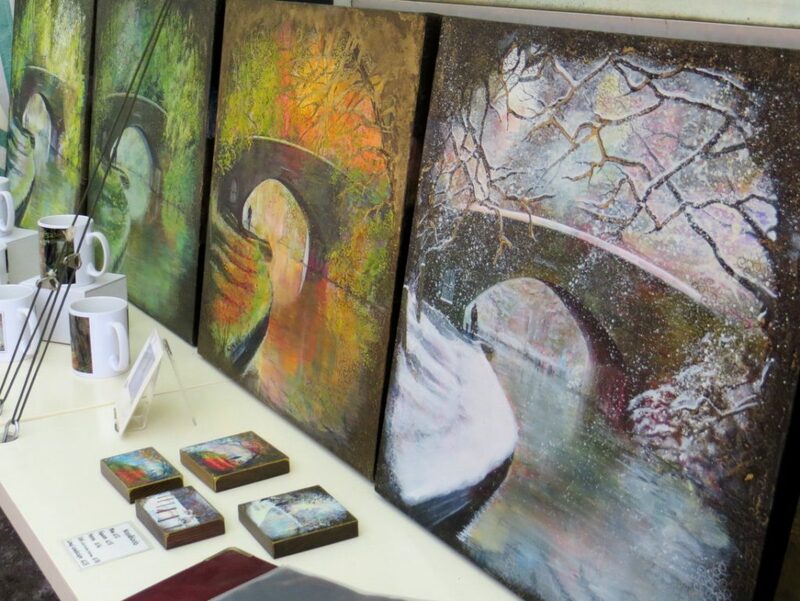 Setting up gallery on The Art Boat at Berkhamsted floating Market, Rickmansworth festival and Boxmoor. Berkhamsted in particular was a fantastic event for me with the people of the town embracing the market wholeheartedly and making us feel really welcome. 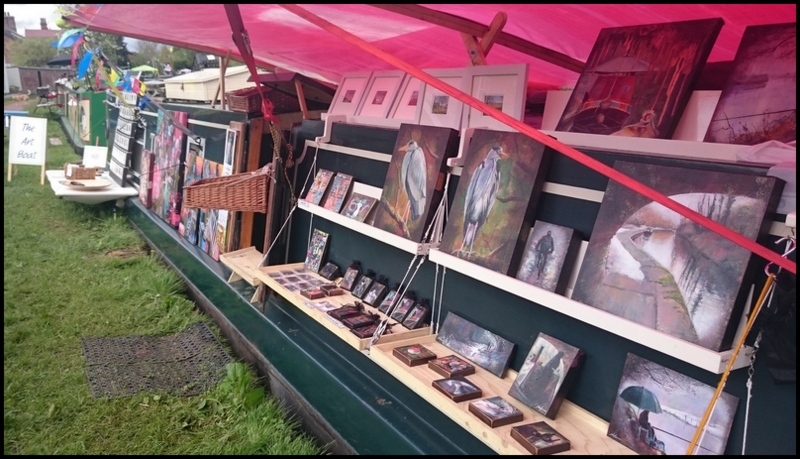 My stock of paintings was already low before I was (easily) persuaded by friends on The Hippie Boat to carry on my journey and pop into London. It has been an experience. A very different way of boating, but one that I am glad to have experienced. I am now up on the Lee in Hertford enjoying this beautiful town and getting ready for The Ware Festival next weekend. After that it is back to London and the Mile end festival. Still waterside based but not on the canal this time. Titled Quietude 1,2,3,4. Each one is 8″ x 8″ Number 1 is already sold but hoping to get the other three on my website soon. And lastly …I hope you enjoy the main photo taken in Berkhamsted. A very rare occurrence (the only time to date! ), of TheArtBoat moving with awning and shelves already set up. It was a scary moment, and only made possible by the stillness of the day. Thank you Alan Price for the photo and Barry Sharland for the expert steering. I’ll say it again…What a year! This year has brought many challenges, the biggest of which was single handing Tonka for the majority of the 6 months of TheArtBoat tour. I often single hand but not usually for so long a period and with so many time pressures. Festivals and Markets won’t wait for you to get there and although my planning is getting better, I had originally planned the route with two crew in mind. Unfortunately my partner had injuries that meant he couldn’t be with me for the travelling this year and this meant I was thrown in at the deep end. But you know what? It was fantastic! I loved almost every minute of it, and although I was sorry that Barry couldn’t join me, the feeling of accomplishment was great. I may even get used to tunnels in time! Thanks to Barry, The Art Boat has now got shelves along the whole of it’s length. This means that all of the space under the awning can now be filled with paintings, prints and cards. I love it when Tonka is dressed up as The Art Boat. 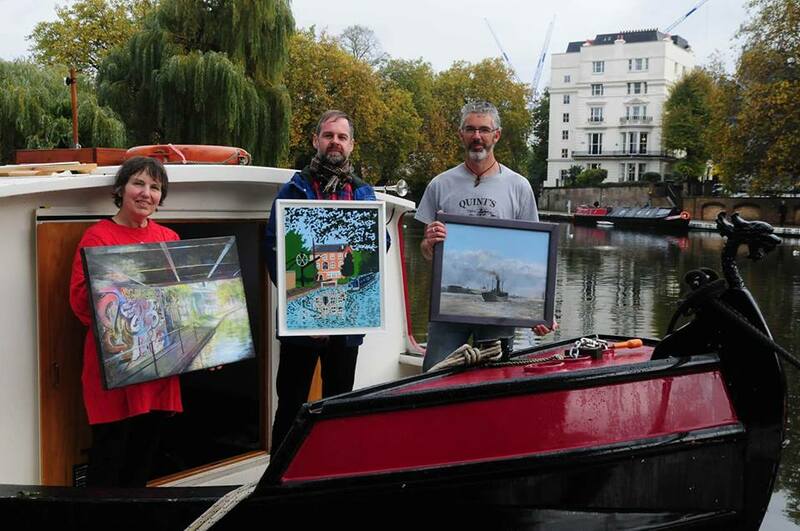 This year The Art Boat managed to be featured in a couple of online articles. One of these was on the Canal and River Trust site. I was really surprised as, being the numpty I am I hadn’t realised I was actually being interviewed. I thought I was being asked if I would like to be interviewed in the future. I chatted away not feeling under any pressure, oblivious to the fact it was a real interview! I musn’t forget to mention Kev Maslin. A brilliant photographer and responsible for the photo at the beginning of this post. You can see more of his wonderful work here. Thank you to all my Customers! So many paintings this year have left me to be rehomed. I am feeling overwhelmed that I am finally able to say with conviction that this is my full time living. I am an artist surviving by my brush  (I have been saying it for a while but not really believing it). A wholehearted thank you to all my customers. Whether you have bought a painting, print or a fridge magnet you have all helped to get me to this place. The next few months will be mostly about getting more painting done, ready for the beginning of TheArtBoat 2018 tour…Bring it on! 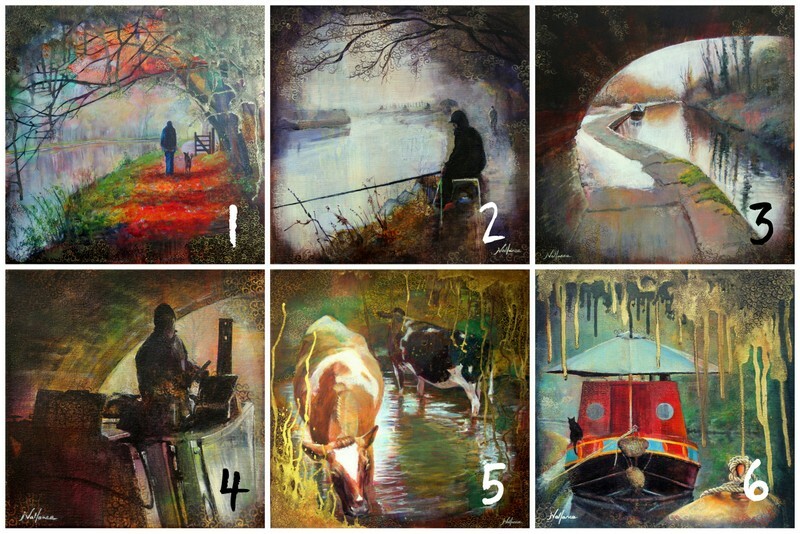 Chance to Win a set of 10 Fine Art Cards. 10 Paintings in 10 days. 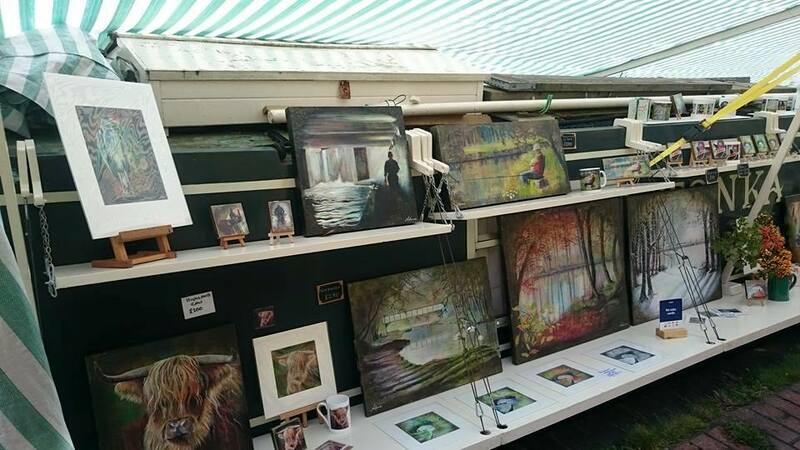 After my Spring and Summer season on TheArtBoat I came straight back to an Open Studio Event at Vernon Mill with the prospect of very few paintings to show (my successful year had it’s downside). Not to be deterred I got my act together and challenged myself to produce 10 paintings in 10 days. Each one on a 8″ x 8″ canvas . Two have already sold (nos 9 and 1) as well as several hand finished 6″ prints. I will eventually be adding them to my shop but meanwhile contact me if you are interested in any of the Originals or prints. 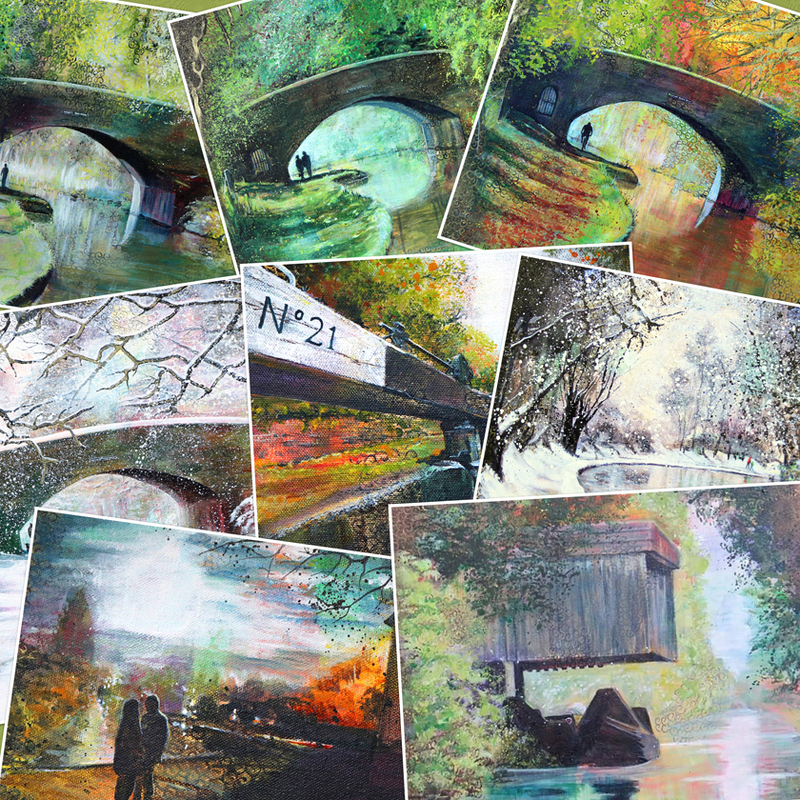 To celebrate the end of a challenging season I am giving away a set of 10 Fine Art greetings cards to one lucky winner. 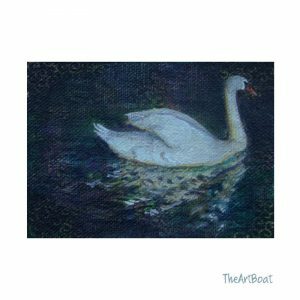 All you have to do is subscribe to TheArtBoat Newsletter on the form at the side of this post. I will also be sending a discount code for anything in my shop (If the item you want isn’t there yet, just let me know and I will sort it! ) The cards are made with slightly textured prints mounted on brown card with a recycled paper insert. They are left blank for your own message. 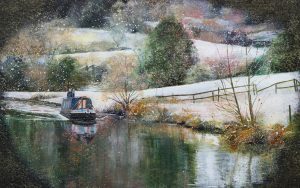 The Newsletter is a brand new venture for me, and is intended to keep you up to date with The Art Boat and exhibitions and new works by Jan Vallance as well as special offers. 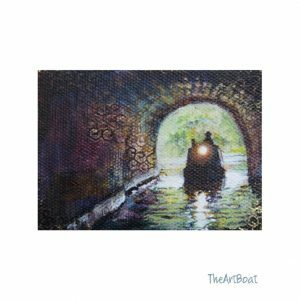 The Art boat has set off on it’s travels again and there has been a lot of miles covered. For the first part of this years tour I have been single handing so I have had very little time to let everyone know where I am up to. I will amend that now and get to the point of the post …A list of places where you will be able to find me over the coming months. 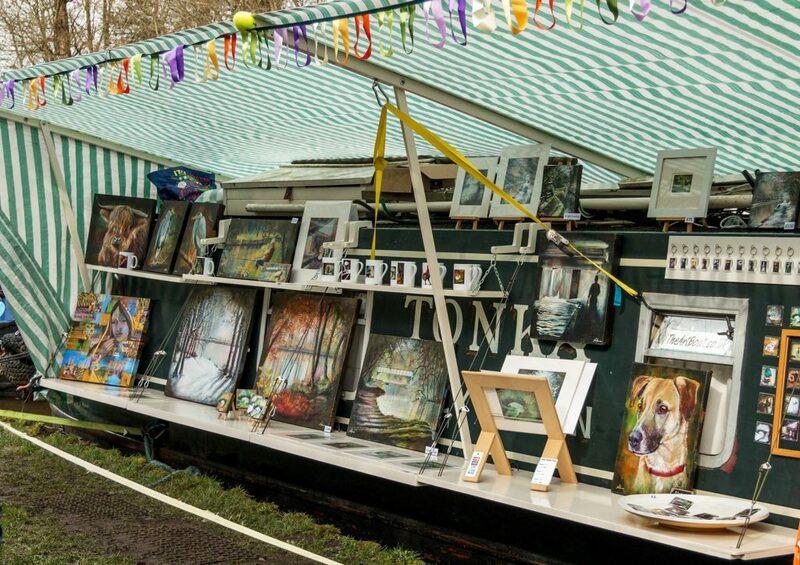  Saturday 20th May – Sunday 21st May Rickmansworth Canal Festival. 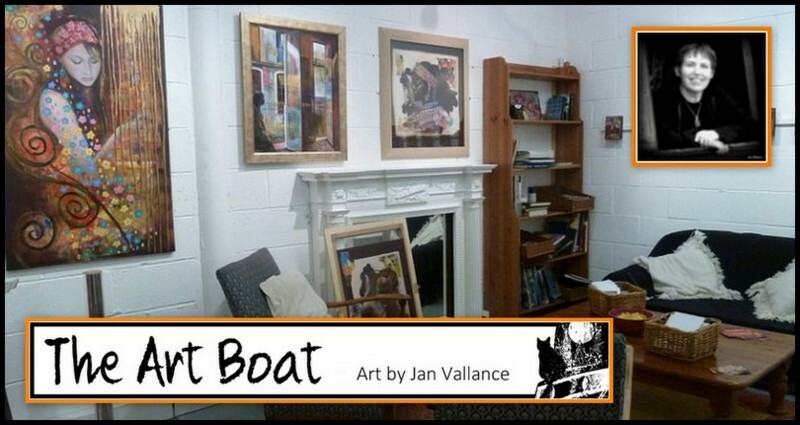 The Art Boat Artist …Jan Vallance. It is complete chaos here on The Art Boat. I am getting ready for the long summer, painting, making a new workspace. keeping up with woodblock orders and finishing my website, I can’t believe it is now only a week until the first gala at Buxworth basin. I have been working on an “about” page, for the Website, and thought it might be a good idea to blog it for some feedback. Please have a read and then let me know what you think so far? I don’t want it to be too long, but hope I have included enough information without boring the socks off people! I have been painting and selling my art since 2005. 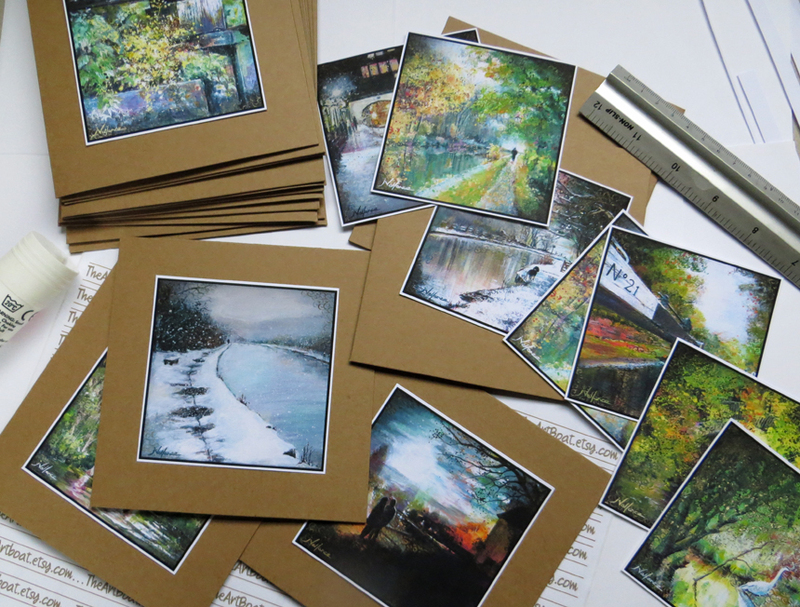 In the winter I work from a studio in Vernon Mill, an old mill in Stockport housing the studios of over 50 artists. The studio gets bitterly cold, so I often work from a makeshift studio in my mum’s loft. But the Spring and Summer is my favourite time. This is when I work from home. 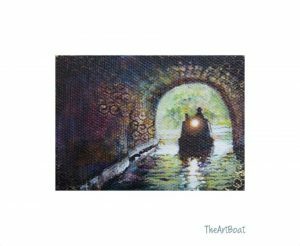 Home is a narrowboat, and from late March to the beginning of October it becomes The Art Boat, my home, studio and floating gallery. I travel the canal system, popping up at floating markets, festivals, and sometimes just on my own. Limited space means that smaller paintings are more practical to work on and this is where my miniature pieces are ideal. 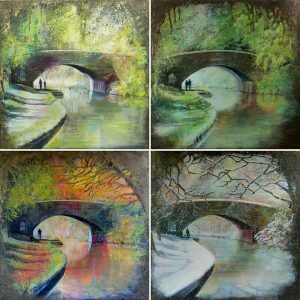 This year’s series are all waterways based and are painted under the loose title “Mini Mondays”. My work isn’t limited to miniatures though, I paint larger pieces too. I am inspired by my surroundings, and like to work on projects that explore different aspects of a subject. 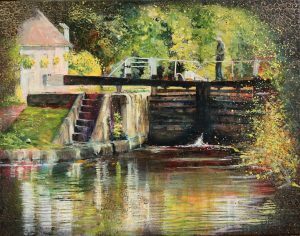 I live and work on the canals and they are the primary influence on my current paintings. I work with layers. The paint and it’s application is all important. I apply paint quickly, filling the canvas and then start exploring…. printing, scraping, doodling. The image comes later. Sometimes I work with the subject, other times against it. I love paint – exploring it’s possibilities. 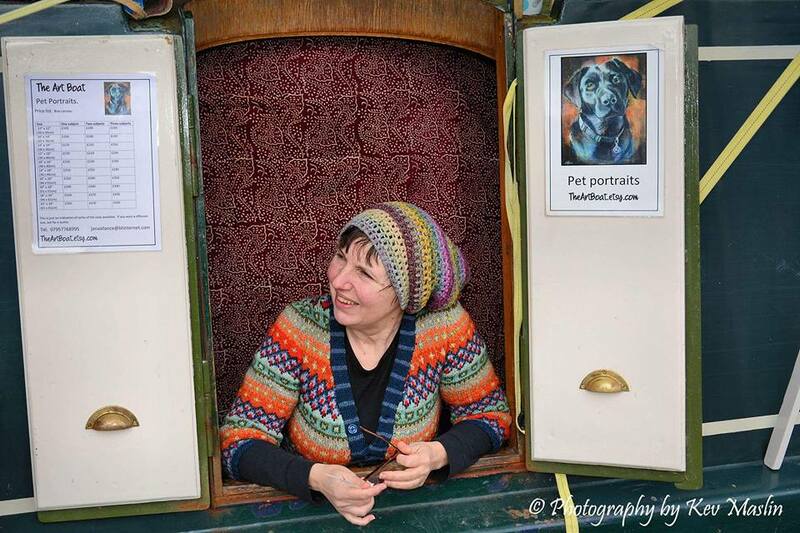 Last year (2015), I took part in the Artists on the Canals tour, organised by the inimitable Magda and Berth on Wanderlust . Three “Art Boats” travelling together and popping up along the canals. 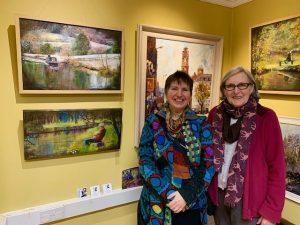 Exhibitions at the Queens park Arts centre in Aylesbury, The Old Town Hall in Hemel Hempstead and The Cha Cafe in Cassiobury park, were also part of the tour. Vernon Mill Artists at Stockport Art Gallery. Once apon a time, a long time ago, when my children were knee high to (ok…they were probably a bit bigger than that), I needed a way to earn a bit of extra money from home. I was browsing ebay to see if it was a possible avenue for some of my smaller paintings, and I kept seeing the word ACEO pop up. I hadn’t a clue, but I researched and discovered that ACEO’s are playing card sized works of art that were being sold and traded all over ebay. Mostly in the US at that time. So what exactly is an ACEO? Absolutely! I can guarantee once you start painting them you will find lots of reasons to make more. So where does Mini Monday fit in? A couple of years ago I started a daily painting series. I painted a sheep painting a day for a year. I loved the project and I found the discipline that was needed to complete one every day was really good for me and has stayed with me since that time. 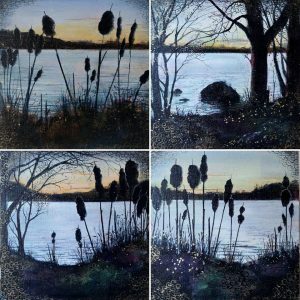 I started the Mini Monday series, because I wanted to do something similar that would fit in with the Waterways paintings I am doing at the moment. So once a week (usually on a Monday! 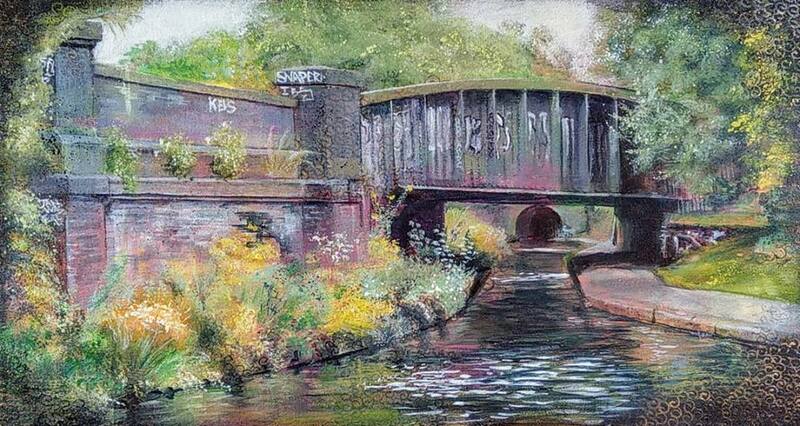 ), I paint a miniature waterways painting. Today I completed Mini Monday 7 (the swan painting at the top of this post). So keep a look out for my Mini Monday …Tiny Tuesday…Wee Wednesday… Paintings. 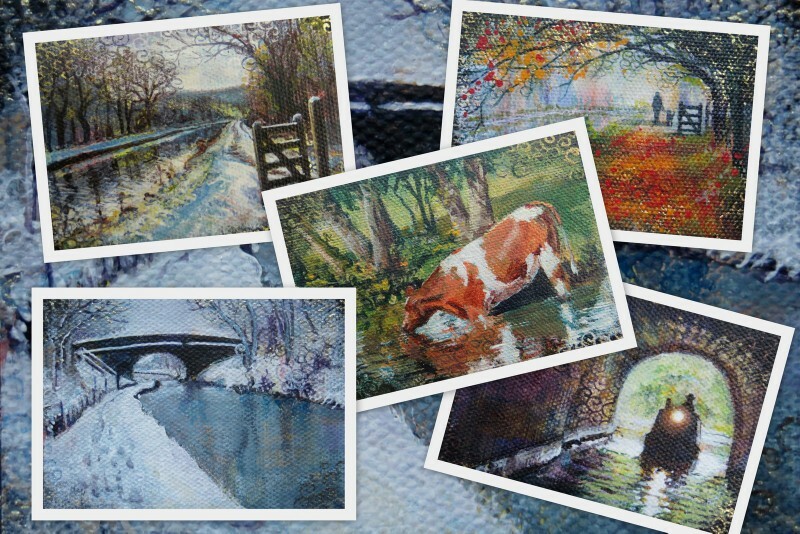 I will be adding them to the Miniature Paintings Gallery each week. Thanks for reading, and don’t forget you can have immediate notifications of blog updates if you subscribe to email updates. 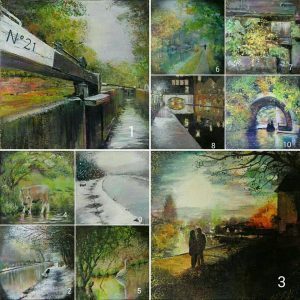 Oh, and if you want to know any more about my Mini Monday paintings, or are wondering how to get started making your own aceos, Just leave me a comment.